Agriculture is an important sector of the national economy. Modelling in agriculture is extensively used to evaluate and simulate the development of this industry. There are two main purposes for the development of agricultural models: to develop a scientific understanding of a particular system and obtain information in order to justify agricultural policy decisions and predict their implications. 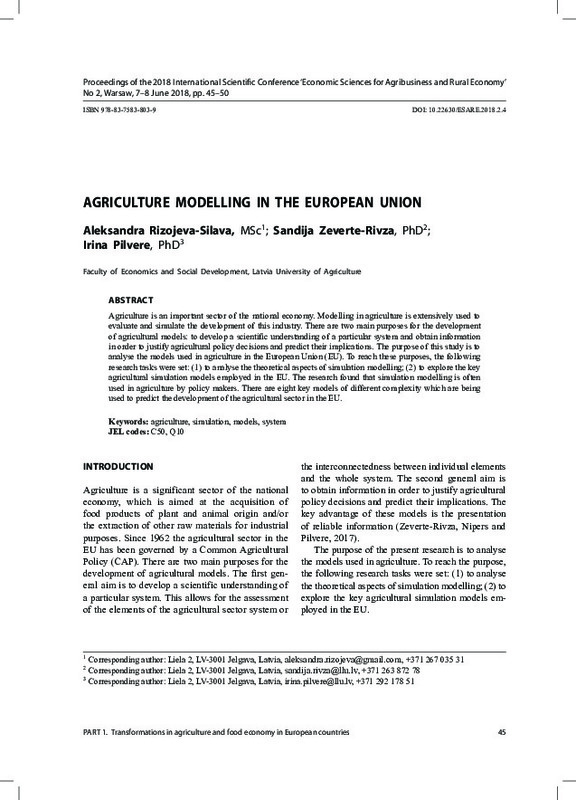 The purpose of this study is to analyse the models used in agriculture in the European Union (EU). To reach these purposes, the following research tasks were set: (1) to analyse the theoretical aspects of simulation modelling; (2) to explore the key agricultural simulation models employed in the EU. The research found that simulation modelling is often used in agriculture by policy makers. There are eight key models of different complexity which are being used to predict the development of the agricultural sector in the EU.